Achieving lower cholesterol can save your life. This fact is rarely disputed by anyone in the medical field. In fact, for at least the last several years, medical professionals have known that by not lowering cholesterol, patients run the risk of serious build up. Most of concern surrounding a build up of cholesterol in the arteries relates to the fact that it can lead to various types of heart disease, not the least of which is hardening of the arteries and a blockage of blood flow through the arteries. Recent research has found one more type of occurrence is prevalent in people who still fail to lower cholesterol levels in their blood. The research was conducted at Michigan State University (MSU). It found that cholesterol in the blood tends to crystallize. This crystallized cholesterol then expands and can burst. When it explodes it sends debris back into the blood stream. The floating crystals interfere with the natural clotting of blood, making larger and more clots, and this then leads to a blockage of the arteries. The domino effect is put into place and the final block to drop is a stroke or heart attack. MSU researchers compared this to freezing a bottle of water in the freezer. Cholesterol, like ice expands. As the ice melts it breaks apart and floats through the water. This same type of reaction occurs with high levels of cholesterol in the arteries. While there are many prescription drugs used to lower cholesterol, it can be accomplished naturally and without the side effects associated with cholesterol drugs. 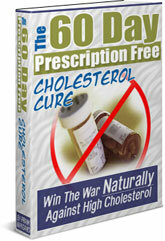 A plan for eating and exercising right to lower cholesterol can be found in The 60-Day Prescription Free Cholesterol Cure.